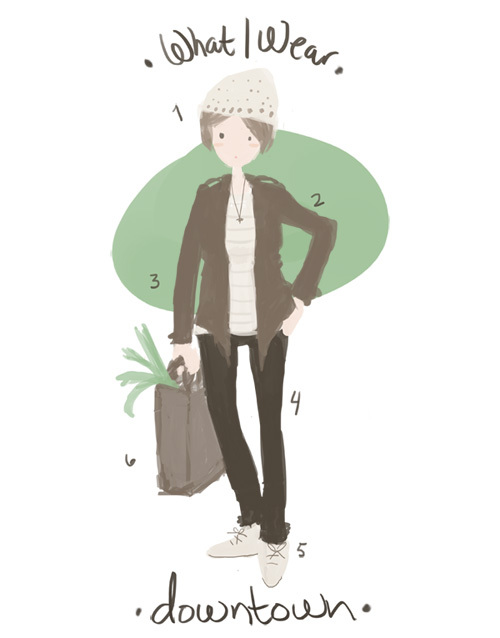 Audrey Elisabet: What I wear | Downtown. What I wear | Downtown. On Monday we dragged our asses downtown. We had to return one of Ylfa's Christmas presents. We got her a huge Lotso bear from Toy Story but it had a hole in it so we went to exchange it. It was actually pretty funny walking around downtown with it in a big bag in front of the stroller. So many people were suprised by this evil looking bear that was peeking out of the bag and staring at them. Hehe. We also went to the Ferry Building and met up with a friend and did some grocery shopping. I love that place. There are so many goodies there. 1. A cute hat my sister-in-laws mother-in-law crocheted. We have one for every person in the family! 2. I got this jacket in a cute store in Hayes Valley I don't remember what is called. 3. Marinó got me this Cheap Monday sweater when he came to Iceland for Ylfa's birth in March. 4. My black All Saints jeans always make me feel super good about myself. 5. When I was pregnant my feet grew a whole size so I was forced to buy myself some new and comfy shoes. I got these Shoe the Bear shoes in GK Reykjavik. 6. Leeks and potatoes for my soup in a brown paper bag I got for 10 cents at the grocery store. It was a fun day that ended with some elderflower margaritas. Yumm!